First, I have to expand upon what I mentioned on my homepage. I simply must apologize for my apparent inability to predict when things will be done. I have been terrible at predicting my schedule this year. 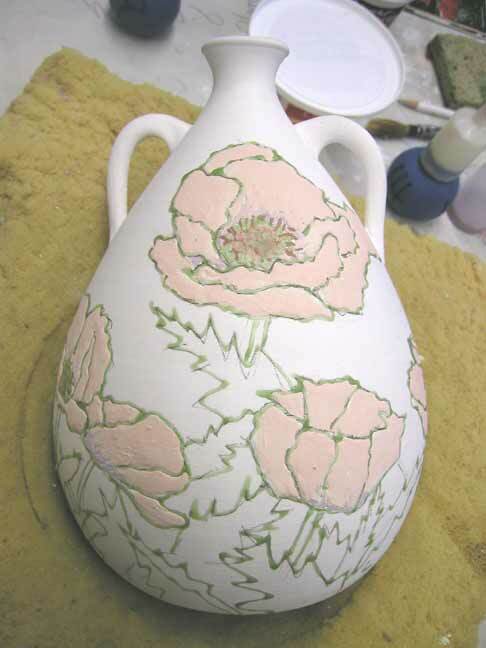 Pots have been taking longer to decorate and then when they are fired, I frequently feel the need to refire them. That means they are going to be around for another firing and that means that they will be in the studio another two weeks. I am just giving up on predicting when things will be available. I hate to do that to those of you that ask when things will be available, but it is best. I have said many times, and I very, very rarely break the rule (twice? 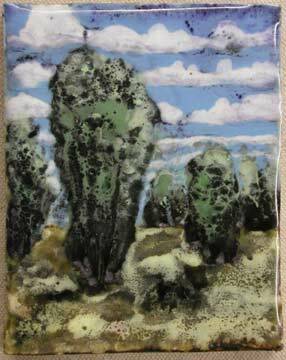 ), that pots will only be available when I update the site with "pots for sale." There is one exception- and this will encourage you pot devotees to visit St. Louis- if you come by the studio, things are different. If I have pots for sale, you are welcome to them. From now on, you will not hear me predicting when pots will be completed and available. Pots will simply be available when they are ready. The most important thing is that I have your email so that when I update, I can send a message about having done so. I notify everyone as quickly as I can send the group emails out. I try to treat everyone equally. Of course, if you come by the studio, your pilgrimage is something different altogether! As Bob Barker says, "Come on down!" Or "up" as the case may be. 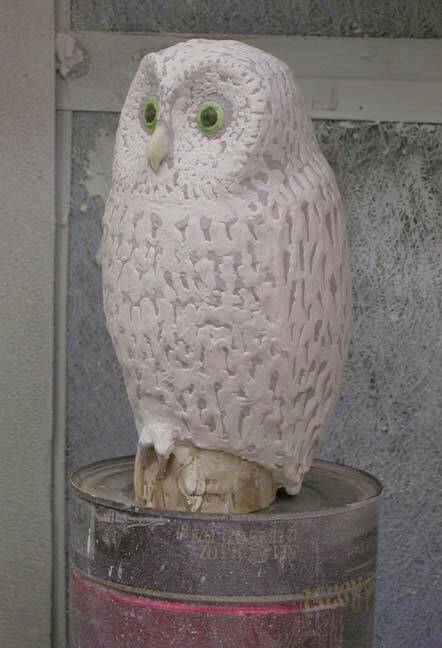 My first two owls are glazed and waiting for the fire. I have high hopes for them. Glazing them was fun and I think they will have a great glaze pattern on them. The glaze is on so thick, there will be no refiring. 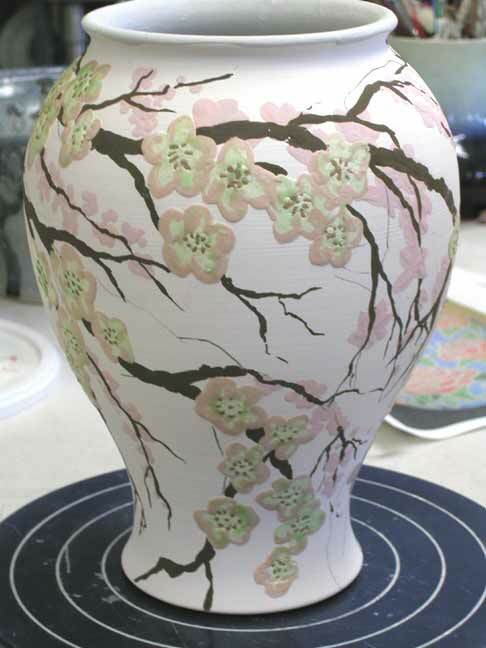 The four pots that I am working on at the moment are all different. Different from each other and different from my usual way of working. 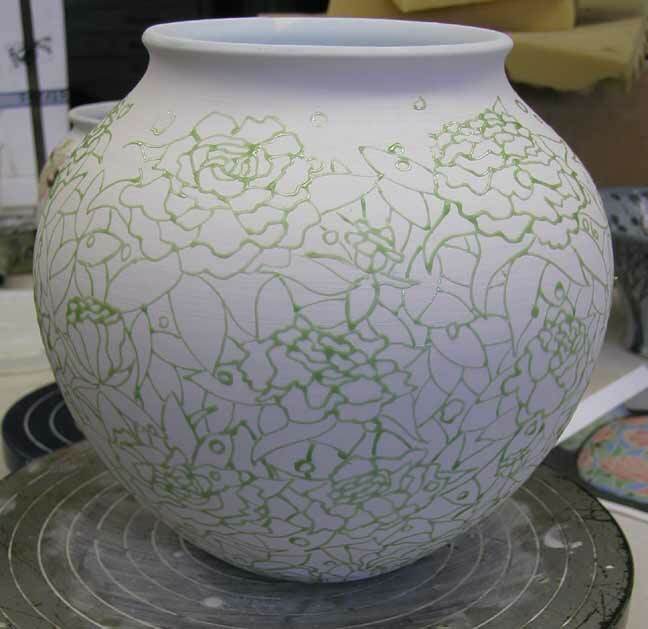 I am working on two of these large "dryline" pots below. I use this technique and variation of it now and then- not very often. One is big and then there is one bigger, about volleyball size. Here is a studio pic of things waiting to be fired. The two white pots on the left are waiting for glaze and they are going to get the royal treatment as they are my last two pots of this year. One will be a Wisteria and the big one will be a "Poppy- Cycle of Life" piece. Here is another new one- new design and new approach to glazing. 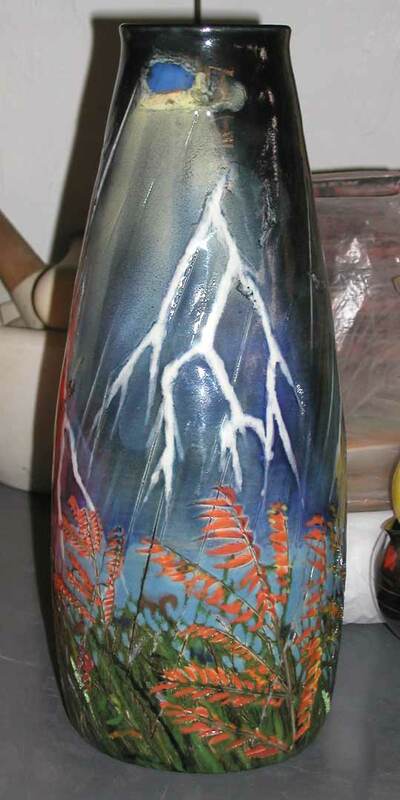 One of the Rain pots close to actual size.